Benjamin was born in London, Ontario. At 20 he enlisted in the military, which moved him throughout Canada and the Middle East. It was in the barren landscape of Afghanistan he first read the words of Christ, after being given a Bible by a friend. In 2007, Benjamin submitted his life and will to Jesus. After 11 years of service, Benjamin left the military to complete a Bachelor of Theology from Emmanuel Bible College in Kitchener, Ontario. Benjamin joined Calvary as Lead Pastor in 2015 and is passionate about preaching the Word, equipping the saints, seeing the lost set free and knowing the triune God in greater depths! In his free time, you'll find him working his farm, doing martial arts, exercising, reading a good book and loving his family. Benjamin is honoured to be married to Rebecca and be the father of 4 wonderful children, Estella, William, Levi and Brenna. Mark grew up in the town of St. Jacobs and he married his high school sweetheart Madeline in 2013. He received a Bachelor of Honours Arts from Wilfrid Laurier University, a Bachelor of Education from Nipissing University, and he is currently working on his Masters of Arts of Theological studies from Veritas Evangelical Seminary. Mark spent a decade working in camp ministry and 3 years in youth ministry before coming to serve at Calvary. Mark is committed to engaging youth in relevant and dynamic ways with the life transforming power of Jesus Christ. Mark enjoys both playing and watching a plethora of sports, hanging out with his family and eating many different kinds of delicious meats such as steak, ribs and chicken wings. Alyssa grew up in Windsor, with a stop in Toronto when she married her husband Luke. She moved to Muskoka in 2015 to serve as the Program Director at Beacon Bible Camp and has been attending Calvary since then. She is classically trained in piano and self-taught on the guitar, and has led music at churches, conferences, camps, and weddings for many years. As the worship leader at Calvary Baptist, she is committed to using relevant, encouraging lyrics and melodies to help the church worship God together. When not helping with music, Alyssa can be found creating new programs for camp, taking nature walks with her daughter in search of all kinds of interesting flora and fauna, going on runs around town, and drinking dark roast coffee. Kristine grew up in beautiful Muskoka. She has always loved teaching and went to Laurentian University to study Sociology, then graduated with a degree of Bachelor of Education from Lakehead University. Kristine taught locally, before taking time off to stay at home with her children Rachel and Julia, born in 2008. 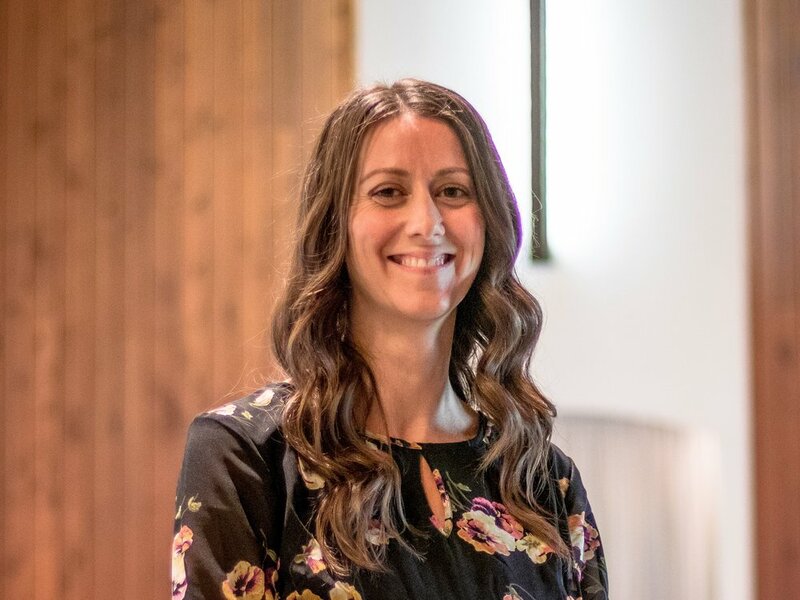 She has been Calvary's Children's Ministry Coordinator since 2015, and is in charge of making sure that the ministry to our youngest teaches them that they are cherished and loved. She met her husband Michael in high school, and they were married 10 years later. Through her ministry Kristine hopes children will grow in their love and understanding of God, as well as experience what it means to be his disciple. Jeanette grew up in Toronto, but spent the summers at her family's cottage just south of Gravenhurst, so the town has always been a second home to her, and Calvary was her church home when she was here. She moved to Gravenhurst permanently 25 years ago, and jumped right into serving at Calvary, working in Christian Education, Missions, Small Groups and Music Ministries over the years. Now, as Administrative Assistant, she is pleased to give support to the various ministries at Calvary. When she isn't working at the church, you can find her at her cottage, giving support to her husband by sanding his soapstone carvings. Calvin has served in various capacities at Calvary Baptist Gravenhurst for much of his adult life and he has been the church custodian for several years. As custodian he is responsible for the maintenance and set-up of the church, as well as property maintenance outside the building. Calvin is also a committed member of the audio visual team on Sunday mornings.